For this test a single 8.5GB file is copied from an OCZ Vertex 2 SSD system disk to the test disk (write to), from the test disk to the OCZ Vertex 2 SSD (read from), and from the test disk to itself (read and write to self). While this test is heavily influenced by the SATA controller and by the number of files being transferred, it provides a good indication of the sustained transfer rates capable from the hard drive being tested. Higher transfer speeds are best. This is just a fun test to see gage real world impact on large file copying and pasting. A simple copying test in Windows Explorer shows what advantage the 750GB Seagate Momentus XT SATA III drive has over the previous 500GB Seagate Momentus XT SATA II drive. Across the board, the 2nd Gen. Momentus XT posts marginally quicker data transfer rates than the 1st Gen. Momentus XT. As we consider the merits of Seagate's 2nd Gen. Momentus XT SSHD hard drive we find ourselves instinctively drawing comparisons between hard drives and solid state drives. Hard drives have the undeniable benefit of low cost per gigabyte and high data reliability. On the other hand, Solid State Drives are incredibly fast on all counts, but more expensive per gigabyte of storage and not very fault tolerant when something goes awry. Seagate's Momentus XT offers an interesting mix of HDD and SSD technologies and costs about $0.33/GB, but in no way should you think of it as a 50/50 technology split. Simple math tells us the Momentus XT is 99% hard drive with 1% SSD flash memory tacked on. So perhaps instead of calling it a Solid State Hybrid Drive - SSHD, a more accurate name might be Hard Disk Drive Hybrid? In any case, the hard drive benchmarks have demonstrated that the 2nd Gen Seagate Momentus XT is quicker than Seagate's 1st Gen. model and comparable to the not so special Plextor PX-128M1S SSD in a few tests. Generally speaking, a straight up SSD will pull (way) ahead on both read and write tests, but fall sharply behind on economics. The Momentus XT does however outperform full size 3.5" HDDs like the Western Digital 1TB WD1001FALS and Seagate 2TB Barracuda XT. On the price per GB front, a typical 120GB SSD runs ~$1.58/GB, a 1TB desktop HDD $0.20/GB and a 2TB HDD $0.125/GB. Seagate's Hybrid Momentus XT costs $0.33/GB, whereas a vanilla 750GB Seagate notebook drive will run about $0.21/GB. 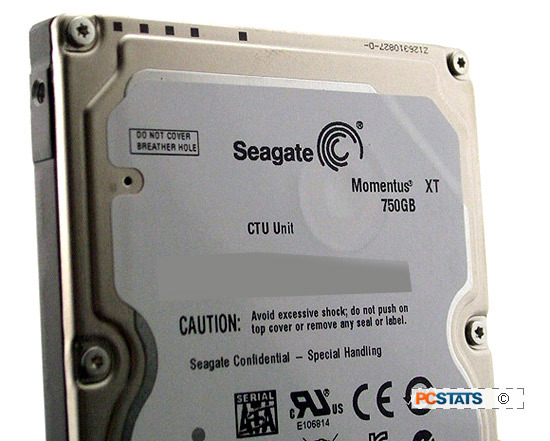 There is a premium to Seagate's Momentus XT to consider, certainly. Data integrity is a critical factor with any flash based storage device. If the NAND flash ever fails or wears out, a built in TRIM function marks those bits off bounds automatically in the Momentus XT. Seagate choose SLC NAND flash which is rated to 100,000 cycles - it's enterprise class NAND flash. Many low cost SSD' use MLC NAND flash which is cheaper, but only rated to 10,000 cycles. The key take away from the benchmarks is that the 750GB Seagate Momentus XT can yield "like-SSD responsiveness" to frequently used applications only when the situation suits it. Application specific benchmarks see a noticeable improvement to their results after about three-to-five iterations, unlike an SSD which tends to witness across the board enhancements. The Momentus XT's write speed is limited to the speed of the hard drive component since this hybrid design writes data to the physical disks first, then to the SSD if the data qualifies. In synthetic HDD benchmarks the Momentus XT 750GB does not witness any significant like-SSD advantages because test data is largely random, thus the Adaptive Memory algorithm doesn't cache it. Seagate dangles a tantalizing carrot when it states there's no reason its hybrid drive technology can't be tacked onto a larger capacity desktop drives. It could be dropped onto a 3TB Barracuda for example... and all signs point to Seagate's upcoming 3TB Barracuda being a hybrid. The hybrid technology is completely transparent to the computer, no drivers are required and the device is system agnostic (doesn't care if its in a Mac, PC, with an Intel AMD CPU), comparable technologies like Intel SRT cannot boast such conveniences. As a 2.5" HDD the 750GB SATA III Seagate Momentus XT performs well in it's own respect, as a novel way to improve system responsiveness the hard drive is definitely worthwhile drive to consider.